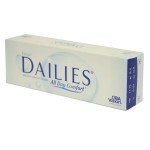 Focus Dailies may be summed up in three words: convenience, availability and comfort. 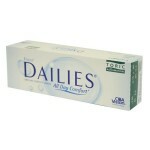 The Dailies brand of contacts from Ciba Vision is available in Dailies Aquacomfort Plus, Focus Dailies Toric, Focus Dailies Progressive and Focus Dailies. Depending on a patient’s particular physiological requirement to maintain a healthy cornea or correction of refractive errors, the Dailies brand is available to meet any patient need. The Dailies line corrects your vision whether you need contact for myopia (near-sightedness), hyperopia (far-sightedness), astigmatism or presbyopia (bifocal contacts). They are designed to provide the patient with the best possible vision while simultaneously maintaining comfort throughout the day as well as good ocular health. Dailies AquaComfort Plus lenses are designed to prevent dry eye complications through its hydrogel material which absorbs and retains water. This allows the lens to remain moist and prevent harmful infections. Focus Dailies Toric correct astigmatism by providing correction in two planes located at 90° angles. This allows light to focus at one point on the retina rather than one; providing sharp, clear vision. Focus Dailies Progressives are for the more mature patient who needs bifocals. By providing concentric zones, these lenses allow the patient to see clearly at different distances. 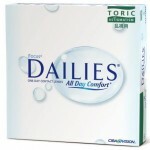 Focus Dailies are the original design of the Dailies line and is being replaced by the Dailies AquaComfort Plus lens. These contacts provide the patient with the convenience of simply tossing the lenses away at the end of the day and starting anew.